Each year we run a cover design project with the final year students on the Illustration degree course at the University of the West of England (UWE) here in Bristol. We select one of the designs for our anthology cover. The submissions never fail to really impress us with their originality and inventiveness – we feel very fortunate to work with course tutors, Chris Hill and Jonathan Ward, and the students on such an inspiring and rewarding project. This year’s cover has been designed by Tim Shute. We took the opportunity to ask Tim a few questions about his design, his studies and his work. How has the Illustration degree course affected your approach to work? It has helped me to develop a new layer to my work and my approach to work. It has made me develop more conceptual work as well as a deeper content in what I produce. Before I started the course I knew how to make a pretty picture with a style I had developed without much deeper meaning or really trying to explain something or present a message. After a lot of reluctance to change on my part (as my tutors will tell you) and a new found willingness to experiment that all came very late into the course, it has led to many more creative opportunities, one being product design. With a newfound confidence that I could do some damage in this field of work, I continued to experiment further with mediums I wouldn’t normally use and really enjoyed the creative process. 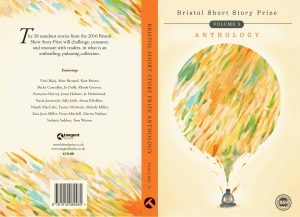 What did you think when you found out your design had been chosen for this year’s Bristol Short Story Prize anthology cover? I was over the moon and couldn’t quite believe that my concept had worked out so well! If I’m honest I was actually running with another idea in the lead up to the deadline but I had a last minute idea and took a gamble, it proved to be a serious brainwave. My fellow students also produced some incredible ideas and I believe any of them would have been worthy winners. What or whom are the major influences on your work? For this piece of work my biggest influence is a man named Eric Carle – his illustrations and books are so vibrant and abstract. I studied him for a module during my second year of university. 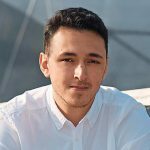 Speaking more broadly, my usual digital style of work is inspired by people like Mago Dovjenko. Being a avid sports fan I try to capture movement and a sense of raw passion/emotion in people like Andy Murray and Rafael Nadal, whom I was lucky enough to meet through a project with Babolat and Wimbledon. It might be an odd perspective but I think most good book covers need something weird! Something with a strong concept to anchor it down as well as being eye catching. 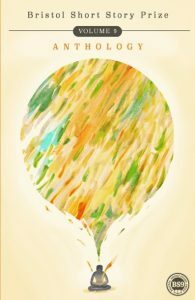 It has to add something extra, something that helps create an identity for its contents and I hope that’s what I’ve managed to do with my cover, for what I’m sure are wonderful short stories by some very talented writers. I feel my cover has elements of something conventional with abstract elements and a strong colour pallet. Which book covers do you admire the most? I love the cover for The Naked Sun by Isaac Asimov. ISSUN BÔSHI, The One Inch Boy, which is a Japanese Fairy tale illustrated by two people who go by the name Icinori and obviously my main inspiration for this cover as mentioned, Eric Carle, with his cover for I See a Song. I admire all these covers because of their extraordinary colour pallets. But one person I very much admire for his concepts and ideas is a man named Chip Kidd, who’s famous for many designs, one in particular being the iconic Jurassic Park image of a skeleton of a T-Rex, for anyone who doesn’t know him; he is well worth checking out. I want to continue experimenting and developing as an illustrator, seeing how I can apply my work further into product design as well as editorial and advertising illustration. I want to challenge myself to take on bigger and bolder briefs. As well as this I’ve started looking into fashion and textiles and want to explore creating sports clothing, I’ve already designed a few things that you can find on my website. We live in a world where we have the biggest platform the world has ever seen and have resources at our fingertips. Over time I imagine I’ll end up specializing and narrowing down my areas, for now though I see no reason to restrict myself, I plan on seeing just how much I can push my creativity and look forward to the challenges that lie ahead. The Bristol Short Story Prize Anthology Volume 9, featuring Tim’s brilliant cover design, will be officially published at this year’s awards ceremony on October 8th and is available to pre-order from our publisher, Tangent Books.